A few weeks ago I hosted a Pinot celebration. I had just received the latest shipment from one of my wine clubs and I was anxious to try one of the Pinot Noir selections. And, because I do love to throw a good party with lots of different flavors and senses sampled, I meticulously planned my menu from appetizer to dessert, with wine for each course, of course. I knew I wanted to do something that would appeal to most of my guests, and since some are not beef eaters this led me to chicken. Chicken often gets a bad wrap, but if done well it can be luxurious. One of my favorite recipes is for a truffle, mushroom and thyme stuffed chicken with mushrooms that have been sautéed in a good splash of Pinot Noir with a touch of truffle oil. You are probably thinking this is something that would be better suited for steak….oh no, the combination with the chicken is stupendous. I also thought it would be nice to start with stuffed mushrooms to carry the theme, a nice cheese plate, a field greens salad with truffled crisps, and I had an opened bottle of Pinot that would be perfect for making poached pears for dessert. Menu in hand I set out for my local Central Market. I think I am a pretty savvy shopper though, so I wound through the departments picking up the items I needed until I got to the cheese section. I had some ideas in mind, but the options are endless in the world of cheese. Manchego? Brie? Goat? Stilton? Cheddar? Gouda? I found the store’s cheese specialist and asked for advice. She was wonderful. I told her I was serving big Pinot Noir with dinner and described the rest of my menu. Her suggestions were right on target. The first was an Italian Sottocenere with Truffles, a Saint Andre Triple Cream Brie, and a lovely aged Goat cheese. I continued on my jaunt around the store to come upon the wine department. I knew I had enough Pinot for my guests for the evening, but I can never pass a wine department without stopping for a look. And, if I am going to take a look, the wine department at Central Market is definitely a great one to stop. The department is arranged by country and region, with helpful maps set on top of each area so you know where each region is. (I used to visit the wine dept at Central Market when I was doing my Sommelier Certification training…the maps above each section, paired with the wines that are available from each was the best training tool…) They have a well trained staff on their wine and beer side as well, with many vendors available to help you make the perfect pairing or to help you find your new favorite table wine. I navigate to Burgundy, one of my favorite regions. I think I love Oregon Pinot Noir so much because it is similar in style to Burgundy, with comparable terrior – climates, soils, slopes and land. Red wine from Burgundy is going to be Pinot Noir or Gamay, (Gamay is only in the Southern region of Beaujolais.) The Northern regions, comprised of the Côte d’Or or the “Golden Slope” is the perfect land for growing Pinot Noir grapes. Pinot is a very difficult grape to grow. It can’t have too much heat but needs long hours of sunlight, it can’t be too cold, it can’t have too much water, or too little, it needs soil that will allow good drainage, it is very susceptible to mildew and fungus which will destroy the grapes. And, even when everything works in the vineyard, actually producing Pinot Noir wines is difficult. But when everything is in line with growing and production, the wines from Burgundy are notably some of the best in the world. For this reason I had to picked up a few bottles to go with my dinner. 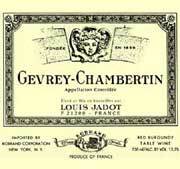 I chose a Louis Jadot Gevrey-Chambertin from Burgundy for our entrée. This went with a few Oregon favorites already in my cellar ready to open – King Estate Pinot Gris for the cheese course, Cristom Mt Jefferson Cuvee Pinot Noir which I had received earlier, and an Eola Hills LBV Port Style wine for the pears. And I was right, the wine was fantastic on its own and when paired with the cheese. The chicken, stuffed and covered with richly sautéed truffled burgundy mushrooms was heavenly, and when paired with the earthiness of both the Louis Jadot and the Cristom the flavors popped. The poached pears were a wonderful finish to the evening. I do love to throw a party, especially one that highlights one of my favorite varietals.